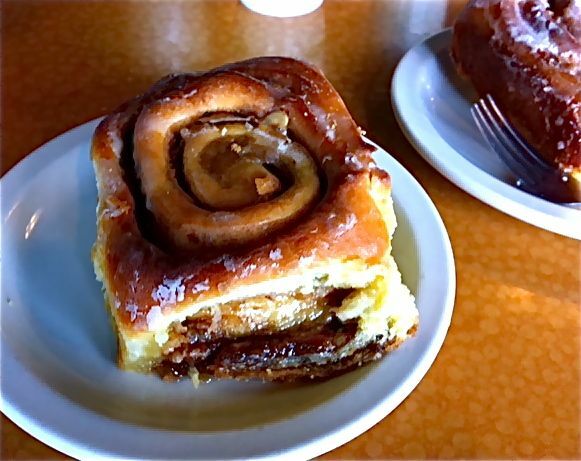 We have started a search for the best cinnamon roll in Portland. We found after today we have some work ahead of us. Wendy loves cinnamon rolls and tries them at most places. Rose and I also consider ourselves connoisseurs as well and try them all over the place. But Rose and I also like roller coasters so we have dubbed ourselves Cinnamon ROLLercoaster Taster Testers. Yep, that would be our perfect job description. Armed with iPhones, we set out with a list and our maps. The 2 places we (meaning Wendy) had in mind today were Jim and Patty’s and Fleur De Lis. Since we were going after our workout class, we decided to make some calls before we made the drive all the way out to N. Portland to make sure they still had some. We called both shops and had them set 2 aside for us. Jim and Patty’s only had 2 left, so glad we (meaning Wendy) thought ahead. Fleur De Lis had the most write ups, so we decided to go there last, you know so we could end on a high note. 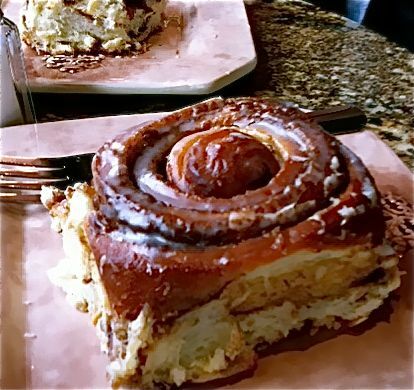 They are known for their coffee cake, but we had also read that the cinnamon rolls were some of the best in Portland. We got there and were greeted by a bustling coffee shop with tons of great pastries. Luckily we had called ahead and there in the back sat our 2 huge cinnamon rolls. We all agreed and ordered them slightly heated. The bread was good and even the outside layer was moist. That’s a plus. The inside had hazelnuts, which we had not seen, but I thoroughly enjoyed. The cinnamon sugar mixture had big chunks of sugar. I didn’t like the texture and Rose agreed. Wendy thought it was fine, but understood what we were talking about. Rose and I both docked points for that. Overall we gave this cinnamon roll an 8 out of 10. I gave it a 7, but they rated it a bit higher, averaging out to 8. I didn’t see the tea, but the coffee was Stumptown. Keep in mind we were doing our tasting during lunch hour. The soups looked great at this place, but we stayed focused. We had also called ahead and had 2 set aside here as well, just in case someone else was having a hankering for cinnamon rolls or doing a taste test. Our initial response was they were dry. Really dry. I even dug right into the gooey middle and it too was dry. There were no nuts, it wasn’t overly saucey and thankfully it didn’t have chunks of sugar, but it was not that good. We all agreed it was a disappointment considering it had the most reviews. We gave this one a 4 I think. Correct me girls if I am wrong. There was plenty of other things that looked fantastic at this place, so don’t shy away, just don’t show up expecting the best cinnamon roll in Portland or you will be disappointed. So much for ending on a high note. They served a Firefox Tea, which is a Portland Co. It was great!! They also serve Stumptown Coffee. I think at this point I could honestly stop looking for the best Cinnamon Roll in Portland because I think I finally found it. It only took me 3 tries, but this is the perfect cinnamon roll. It’s large, it’s gooey on the outside and there were no chunks of sugar, just perfectly covered with the right amount of cinnamon and sugar. Nothing about it was over the top. It is also perfectly priced at just $2.25. I brought half of mine home and it was not even disappointing the next day. Still so gooey. Want to know what else they serve at Fat City? But, that does not mean I am going to stop looking, that doesn’t mean I won’t try another. That means that all other cinnamon rolls will now be compared to the Fat City’s Cinnamon Roll. Check out Our other trip out to find a good cinnamon roll. Have you tried Helen Berhard’s bakery of NE Broadway. Would be curious to see how they compare. I have not tried them, but I should add them to my list since my friends want to start a new search. Fat City’s is the best in the whole universe! I grew up in Multnomah Village and knew the original owner whose recipe it was. Hers were the best but the current owner does them justice too. Anyone who says different is delusional! LOL!! Plus cream cheese frosting is good but keep it on the carrot cake! Tried Fat City and was unimpressed. The bun was hard and stale, it lacked cinnamon sugary goodness and the frosting was a horrible burnt coffee royal icing. Very disappointing. If you guys are still looking for the best cinnamon roll in Portland, Id suggest Helen Bernhard Bakery on NE Broadway. They are fresh, gooey and have delicious cream cheese icing. 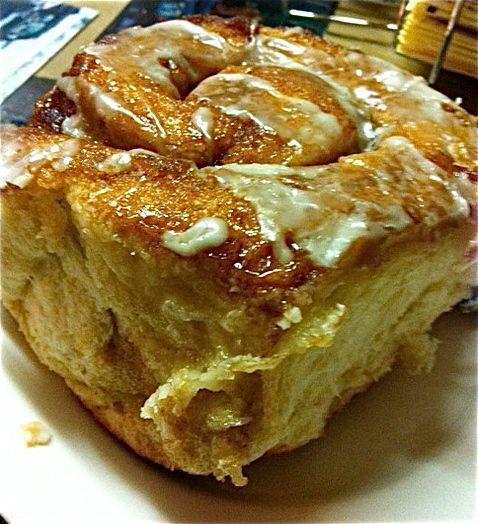 Nothing high end or gourmet about this- just an old fashioned cinnamon roll! What a bummer. What you described is nothing like I have had there. I have only had extra gooey cinnamon rolls there. But I am adding Helen Bernhard Bakery to my list. I do love cream cheese frosting. If you want the some of the best cinnamon rolls in Portland, then you would have to come to my house. Light, moist and no sugar chunks. Delicious! Susan we might have to make our way over. So far we are not off to a great start. The first one looks much better. More home made. I love coffee cake. Keep searching and we’ll go to the winner when I am there.